Here’s some news of the splendid Elephant Stone. They’re releasing a two-song digital single on September 19th as a taster for a new album due next spring. It comprises the 12-string guitar symphony of ‘Love the Sinner, Hate the Sin’ and the eight and a half-minute psychedelic opus ‘The Sea of Your Mind’. You can get a free download of ‘Love The Sinner…’ here. Elephant Stone is the brainchild of bassist/sitarist Rishi Dhir, a founding member of Montreal pop/psyche veterans The High Dials, and in-demand sitar player (Black Angels, Brian Jonestown Massacre, The Soundtrack of Our Lives). 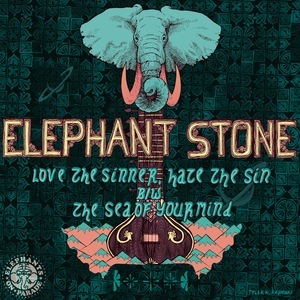 In 2009, Elephant Stone released their debut album, The Seven Seas, and followed it up in 2010 with The Glass Box EP, a 5-song suite of inspired power-pop/psyche classics. They play The Lexington on 18th October with, among others, our good friends The See See.